It was a dark and stormy night when a beautiful and mysterious stranger dropped a basket on the step of Our Lady of Perpetual Misery before slipping back into the shadows. When a nun opened the door next morning, she found a scowling baby wrapped in an old pink plaid sheet. To their eventual detriment, they took the baby Jane Doe inside and gave her shelter. Baby Jane turned from scowling infant to unceasing problem child. All she cared about was booze, bands, and boys. Try as they could, the nuns couldn't tame her. Finally they decided they had to ship her off to reform school, and sent her upstairs to pack her belongings. Baby Jane heard a loud rumbling outside as she was plotting her revenge and packing. Hanging out the window, she spied a glorious sight: a big long convertible overflowing with big bad roller girls. "Hey!" Maliboozer Barbie yelled from the driver's seat. "One of our teammates had to flee the country on a weapons charge, wanna fill her spot?" Baby Jane grabbed her bag, jumped out the window, and never looked back. She changed her name to Simon Le Bomb to honor her favorite frontman and sewed herself a skirt from her old pink plaid sheet. 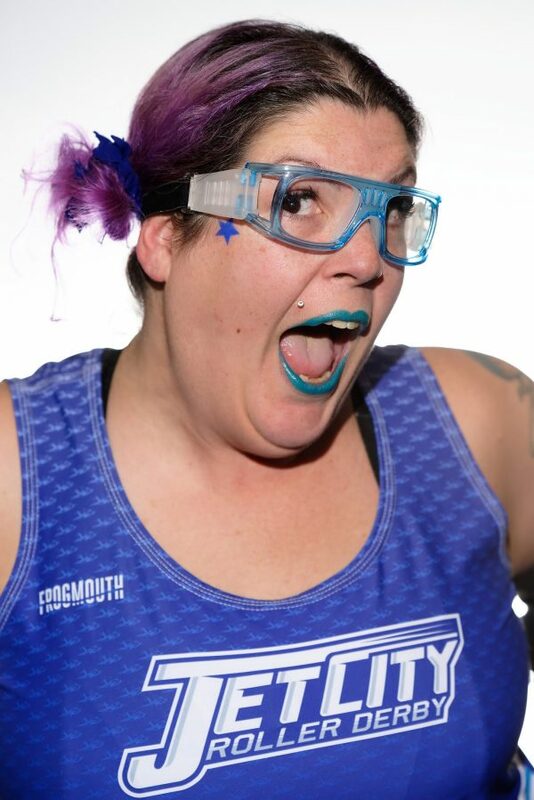 Her derby sisters gave her a real home, and she found her true calling on eight wheels. You can find Bomb on the track, straddling the line of discord and rhyme while taking out jammers and putting down anyone that gets too close to her beloved Pistol teammates. 2015 - Pistols cleanest Blocker.